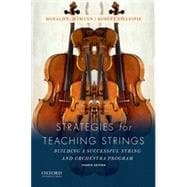 Strategies for Teaching Strings: Building a Successful String and Orchestra Program, Fourth Edition, is an essential guide for prospective, novice, and experienced string teachers alike. This comprehensive text provides all the information necessary to develop and manage a successful school-based program. Based on the national standards for teaching strings and orchestra, the text covers performance objectives, strategies for teaching technical and performance skills, and solutions to common playing problems for elementary, middle, and high school skill levels. It also offers rehearsal strategies to develop large-group ensemble techniques, practical approaches to teaching improvisation, and advice on how to increase student recruitment and retention. Donald L. Hamann is Professor of Music Education and Strings in the Fred Fox School of Music at the University of Arizona. Robert Gillespie is Professor of Music at The Ohio State University, where he coordinates string teacher preparation for the largest string pedagogy program in the nation.